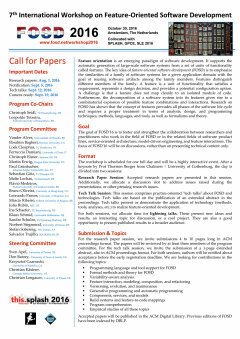 The goal of FOSD’16 is to foster and strengthen the collaboration between researchers and practitioners who work in the field of FOSD or in the related fields of software product lines, service-oriented architecture, model-driven engineering and feature interactions. The focus of FOSD’16 will be on discussions, rather than on presenting technical content only. Research Paper Session: Accepted research papers are presented in this session. Additionally, we allocate a discussion slot to address issues raised during the presentations, or other pressing research issues. Tech Talk Session: This session comprises practice-oriented “tech talks” about FOSD and technologies. Tech talks are based on the publication of an extended abstract in the proceedings. Tech talks present or demonstrate the application of technology (methods, tools, analyses, etc.) to realize feature-oriented development. For both sessions, we allocate time for lightning talks. These present new ideas and results, an interesting topic for discussion, or a cool project. They are also a good opportunity to present published results to a broader audience. Accepted papers will be published in the ACM Digital Library. Previous editions of FOSD have been indexed by DBLP.